Hyundai made a major move upward in the automotive world today, taking top honors among non-luxury cars in a major automotive industry study. According to the J.D. Power and Associates 2006 Initial Quality Study — an annual ranking of car brands, individual models and automotive plants — Hyundai is now the third-leading brand in the business, only behind Lexus and Porsche. Last year the Korean automotive company ranked 11th in the study. This year, some of the nameplates Hyundai beat include: Jaguar, Acura, Volvo, BMW and Saab. The report said the Hyundai Sonata produced at the Montgomery plant is the third-best midsize car on the market, only behind Toyota Camry and Honda Accord. The Hyundai Tiburon came in second in the compact sporty car category, behind the Mazda MX-5 Miata. The Hyundai Azera took second place in the large car category, trailing Pontiac Grand Prix but leading Nissan Maxima. The local Hyundai plant — known as Hyundai Motor Manufacturing Alabama — placed 10th among 73 plants throughout the United States, Canada, Mexico and South America. Only one other plant has done better it's first year, and that was Toyota's Indiana plant. Hyundai officials said the high ranking will help overturn perceptions outside of the South that Alabama doesn't have the workforce needed to produce world-class vehicles. "Without the community support I don't thin we ever would have gotten there," said Chris Susock, senior manager for quality control department at HMMA, who worked for Ford for 15 years. "The support that the community has given to the workers here, in my opinion, is unprecedented. 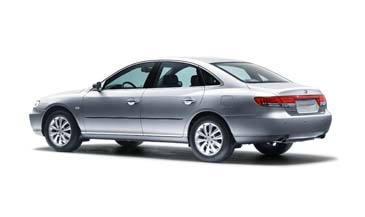 HMMA began production of the Hyundai Sonata in May of 2005. In April, the plant began producing Santa Fe sport utility vehicles for distribution across North America. Scores for the J.D. Power IQS are compiled from responses from 63,607 purchasers and lessees of new 2006 model-year cars and trucks surveyed after 90 days of ownership, the company said. The above article is from Montgomery Advertiser.